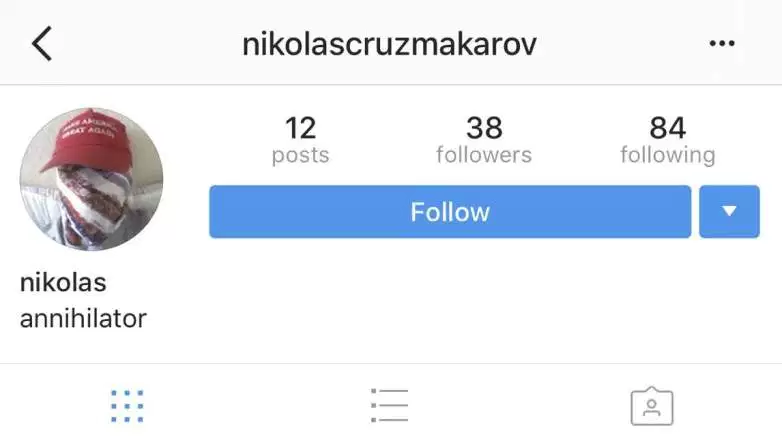 Instagram account of Nikolas Cruz, confirmed by Instagram but revoked after the shooting in accordance with the company policy. “Makarov” is a Russian pistol. 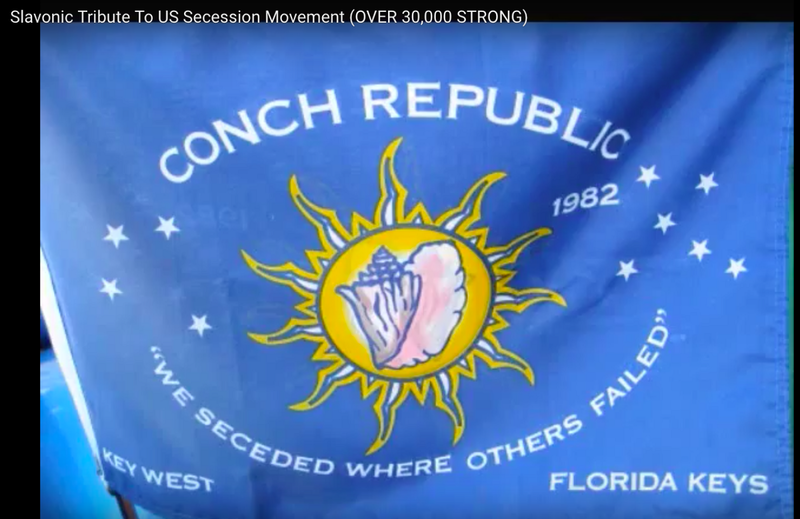 Jereb, the leader of the group, said that Cruz belonged to a Republic of Florida Clearwater “cell ”and drove up with members to Tallahassee to do paramilitary training. 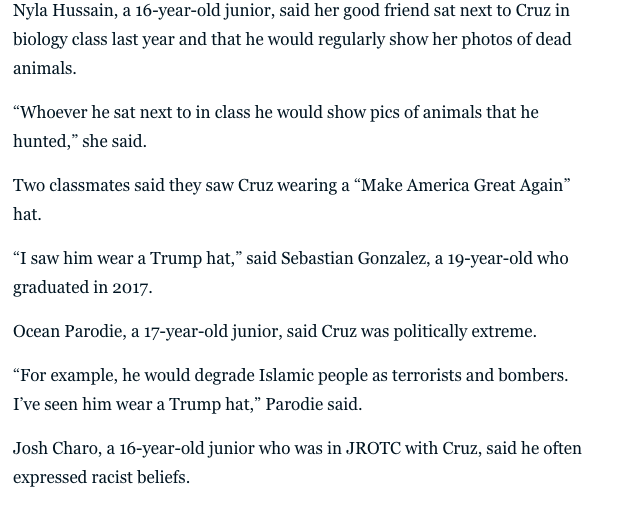 If you think that we are dealing with a bunch of deranged juvenile delinquents, think twice. 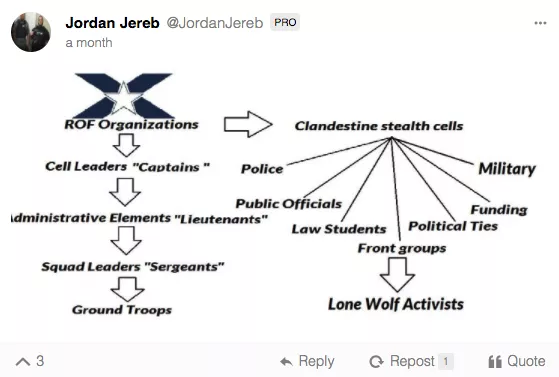 Jordan Jereb’s organizational chart post. From Gab. This tactic can be effective. 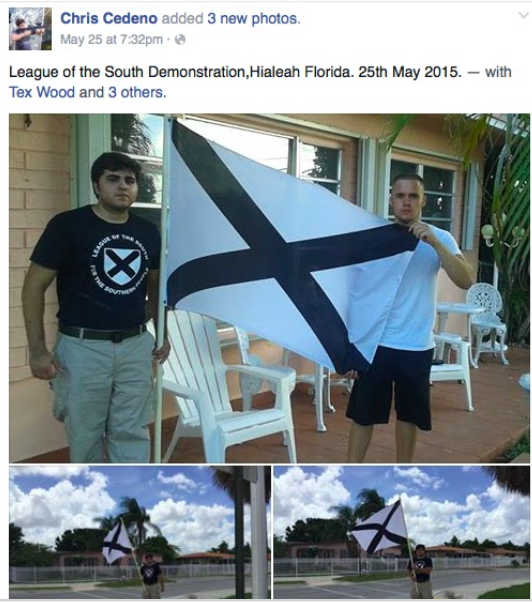 Here are just a few mentions of the latest murders by neo-Nazis “lone wolf activists”: Atomwaffen Division, an American Nazi organization, is behind the alleged murderer of a Jewish college student, Blaze Bernstein, in California and other murders. A 17-year-old young white supremacist William Atchison killed two students at a high school in New Mexico before killing himself. This list is incomplete. 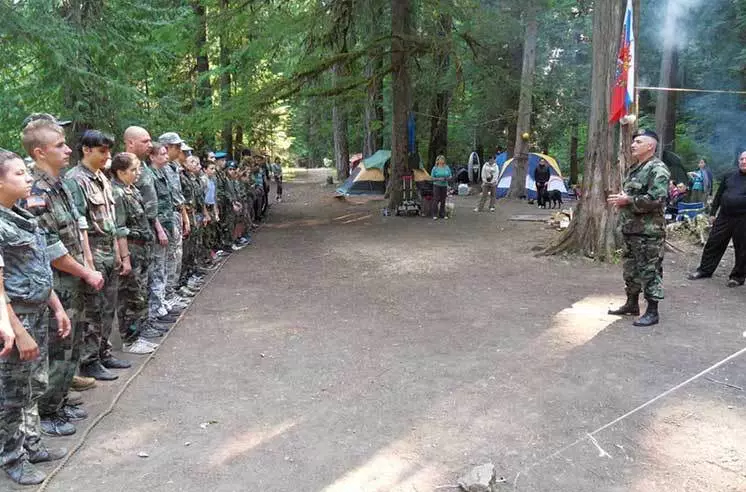 In addition to alt-right, neo-Nazi and militia, there are also pro-Russian paramilitary “boot camps” in California, Washington and Oregon. 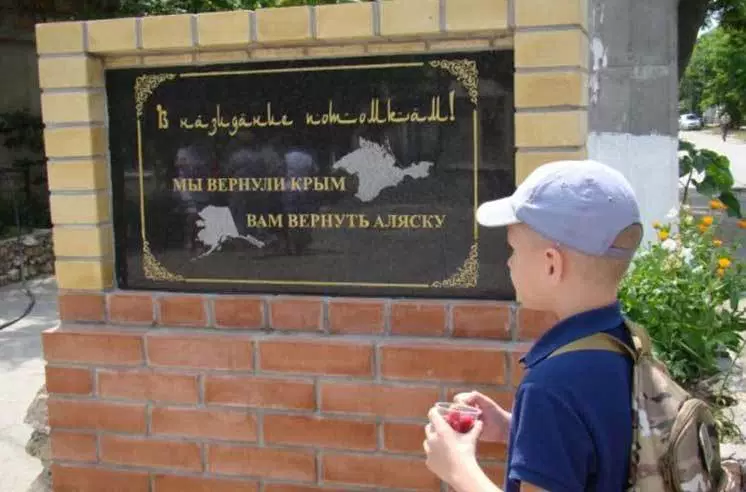 “One of the local Orthodox parishes in Sacramento announced that they would take in those wishing to undergo a kind of “young fighter’s course” that includes handling small arms, a sports bow and throwing knives, as well as drills and patriotic training. Similar youth training camps under clearly Russian names like “Scythian” or “Rusichi” have spread widely throughout the United States. Militarized musters are regularly held in the states of Washington and Oregon. 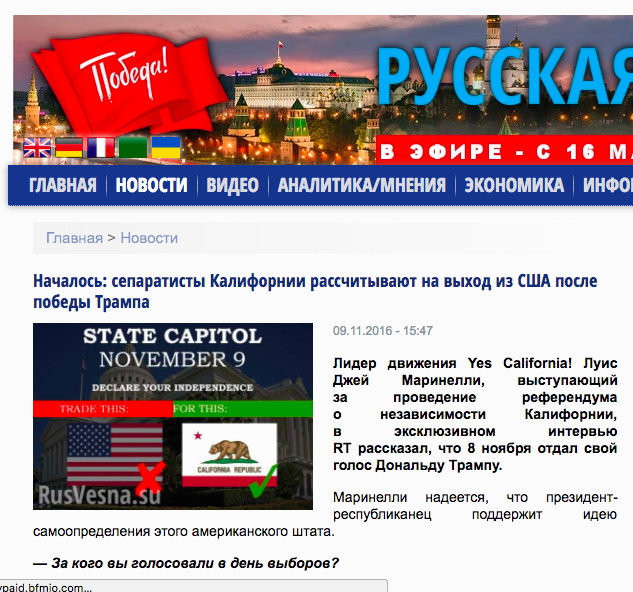 In neighboring California, a “sports-patriotic camp dedicated to the Paratrooper’s Day, a Russian military holiday” had been organized from 2012 to 2015. The groups have clear intentions. 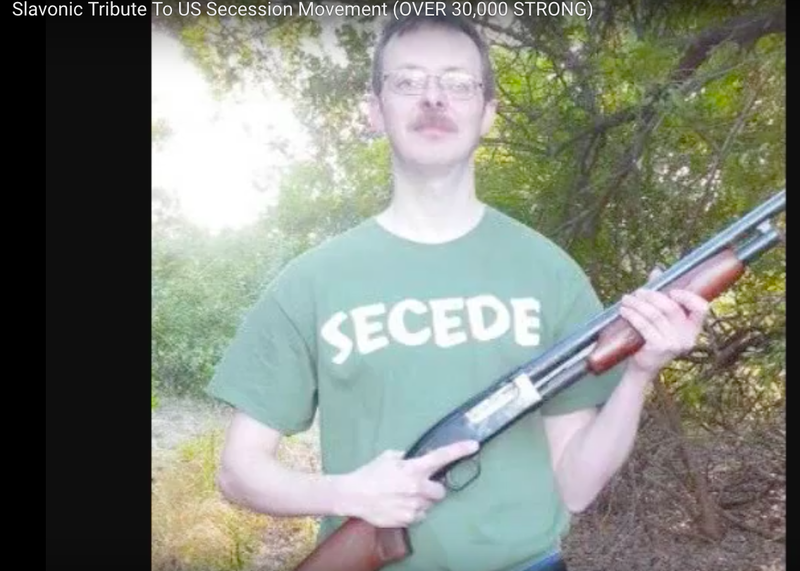 Ten minutes of browsing 4chan and reddit boards leave no illusions. 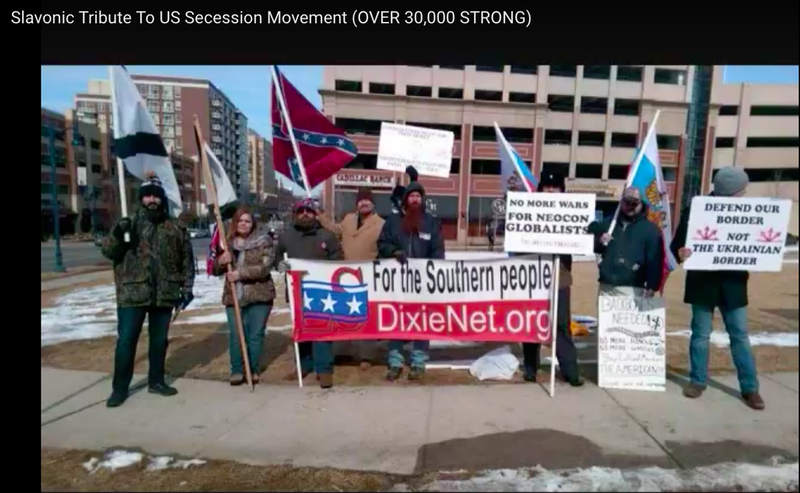 Screenshots from the Alabama Flaggers Blog. Alt-right and neo-Nazi leaders plan ahead and have a vision in addition to the mission. 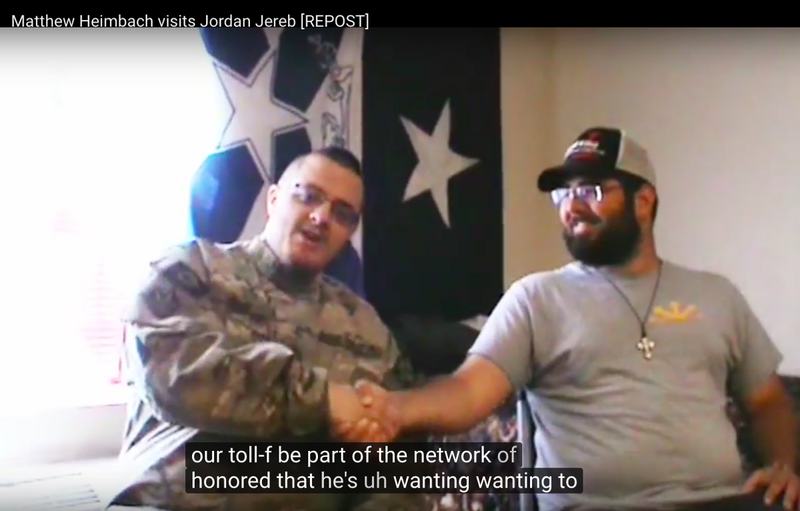 Jordan Jereb and Matthew Heimbach, one of the leading neo-Nazis in the USA, met to discuss uniting “dozens if not hundreds of organizations” of neo-Nazis and white supremacists. I strongly recommend watching the video. 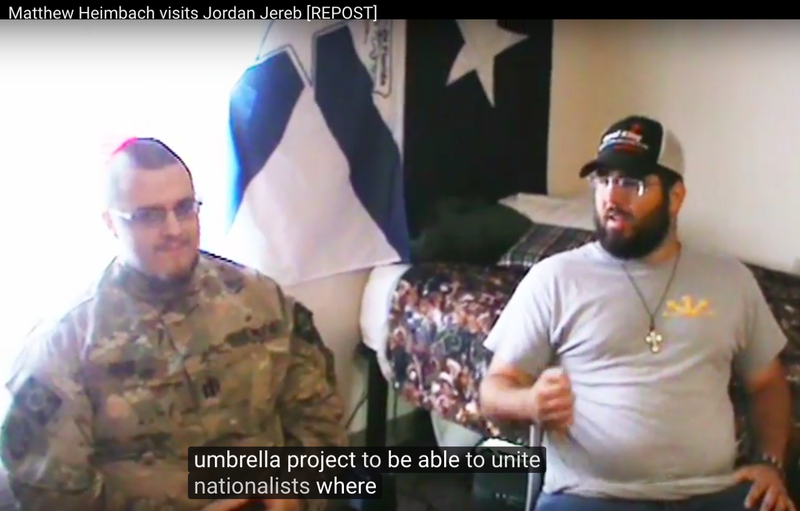 Note the Russian Orthodox Cross that Heimbach is wearing. “The deranged” are not alone. 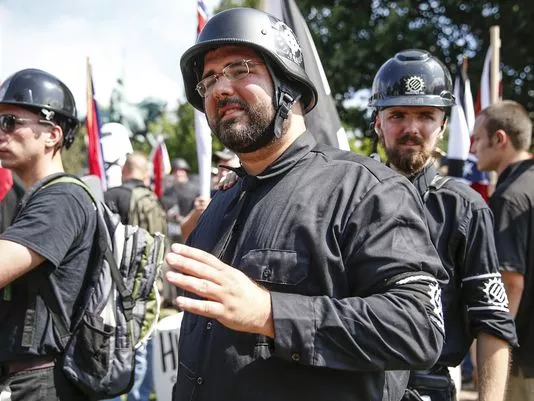 Heimbach, a Russian Orthodox Christian with strong ties to Russian ideologists and admiration for Trump and Putin, is also a member of the World National Conservative Movement, a product of the Russian Imperial Movement (RIM), which describes its ideology as “Christian Orthodox imperial nationalism” and does not hide its ties to the Kremlin. 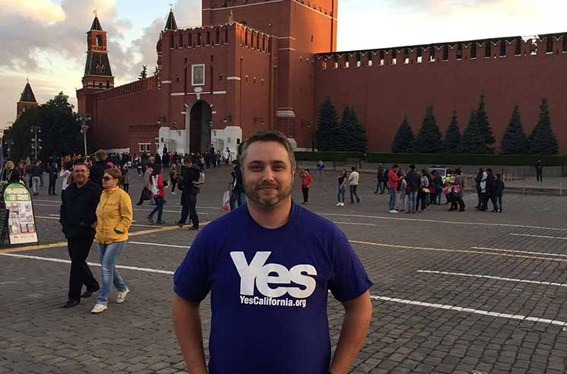 According to Anton Shekhovtsov, a researcher of European far-right movements, the Russian Imperial Movement arose in part from the efforts of a Russian political party founded by Deputy Prime Minister Dmitry Rogozin and a close ally of Putin. The group’s stated goals are similar to those pursued by the Kremlin, including the neutralization of the EU and NATO. Neo-Nazis make no secrets of their affiliations and predilections. Their proclamation of love for Putin is all over the Internet. Left: Heimbach at a protest against the US sanctions. Center: Traditionalist Youth Network/Traditionalist Workers Party t-shirt. 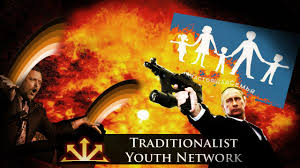 Right: Putin in Traditionalist Youth Network meme. 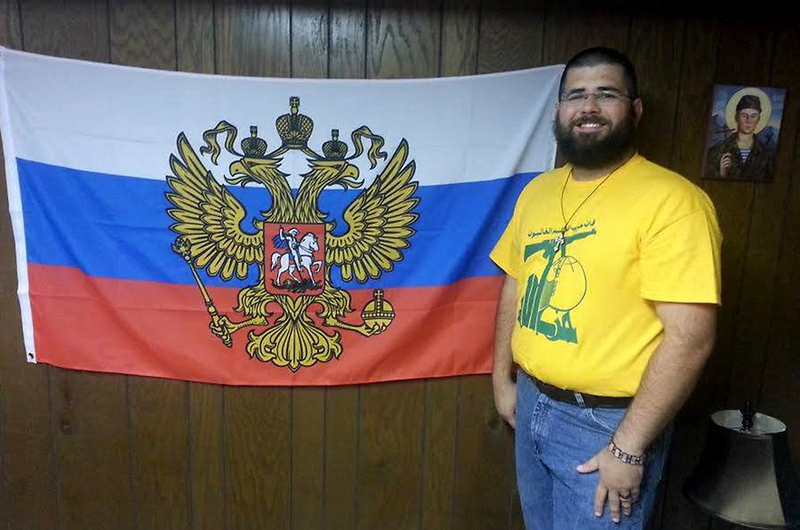 Left: Matthew Heimbach stands next to a flag used to represent the president of Russia in a photo he published to his personal page on the Russian social media web site VKontakte in August 2015. 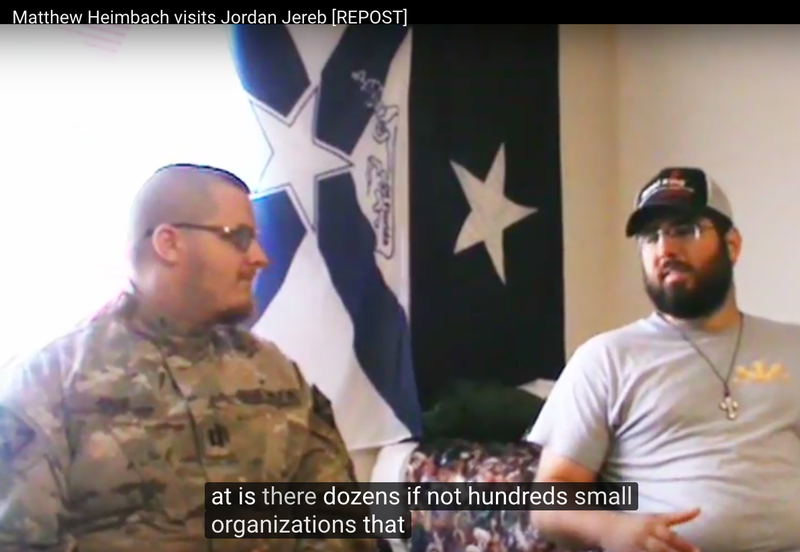 Right: Heimbach in Charlottesville. 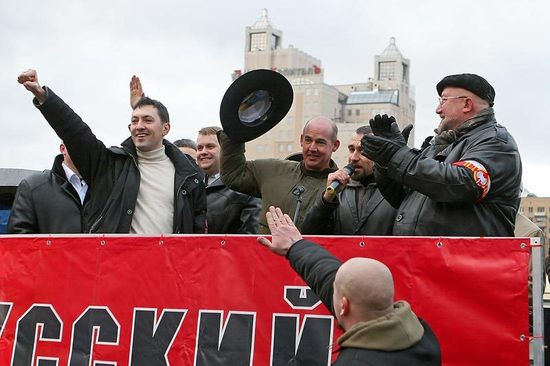 READ HERE ABOUT THE RUSSIAN CONNECTIONS OF THE NEO-NAZI AND ALT-RIGHT GROUPS. 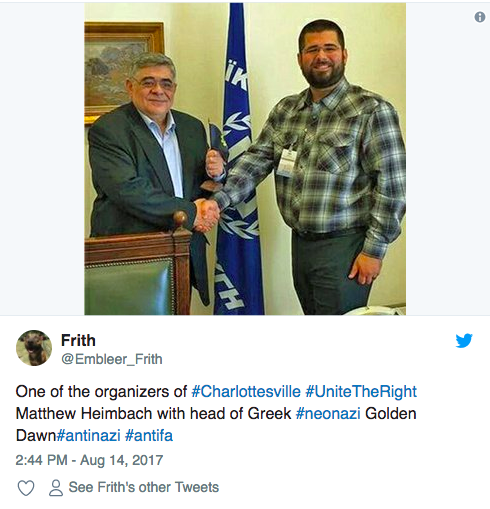 Left: Matthew Haimbach with Golden Dawn founder and leader Nikos Michaloliakos. 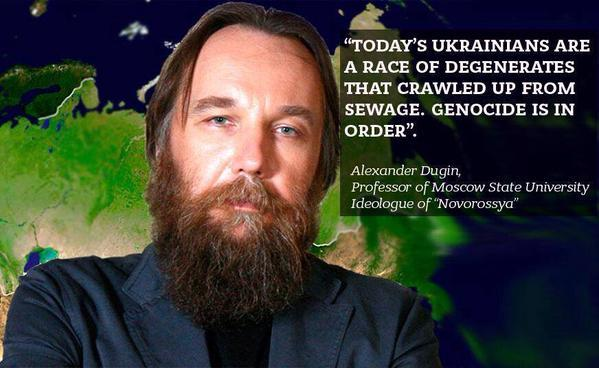 From blog post: “The Golden Dawn is a natural ally of Russia, and is fighting American expansionist policies. 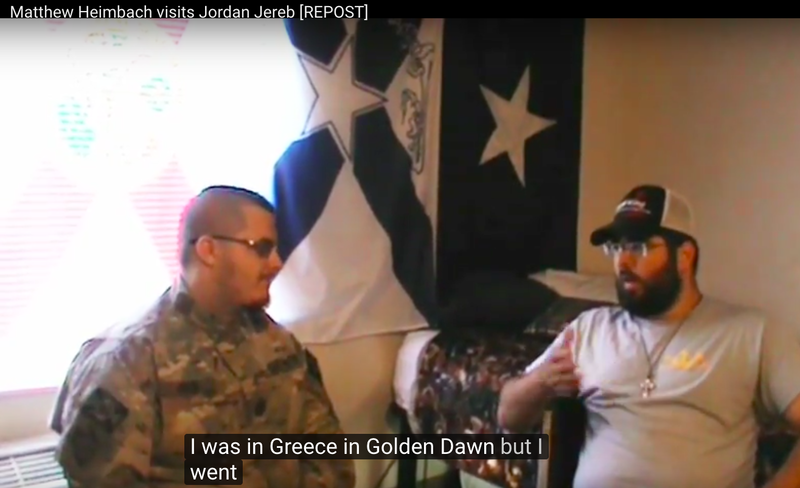 Russia is perfectly aware of the political persecution against us and believes that this is precisely because we talk openly in favor of a geopolitical shift towards Russia.” Right: Artemis Matheopoulos, Golden Dawn party MP, with Alexander Dugin. 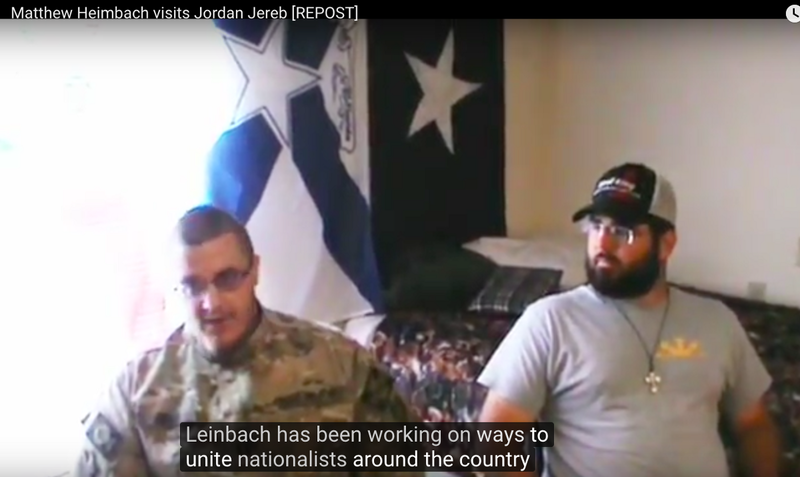 In 2015, Aleksander Dugin — a neo-fascist philosopher, who has ties to virtually every American white supremacist leader in one way or another, hosted a lecture, via Skype, at the Traditionalist Worker Party founded by Heimbach. 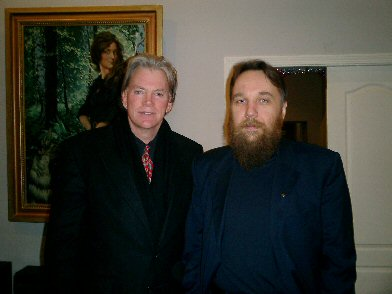 Left: Duke and Dugin. 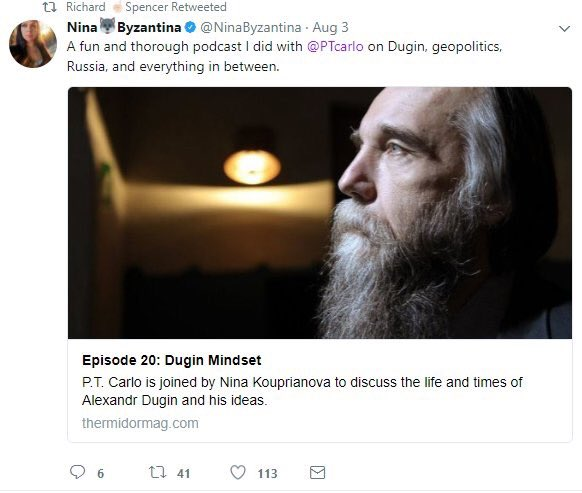 Right: Translations of Dugin’s work by Nina Byzantina, Richard Spencer’s ex-wife and supporter. 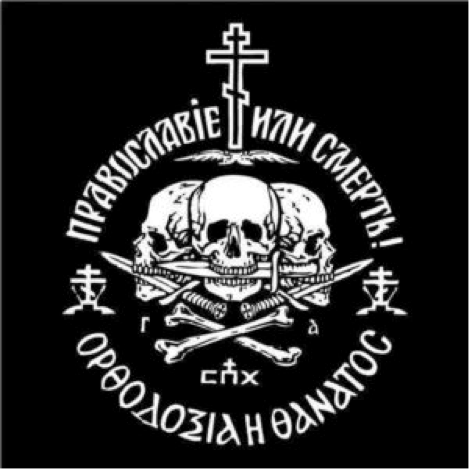 READ HERE ABOUT THE RUSSIAN CONNECTIONS OF THE THE NEO-NAZI LEADERS. 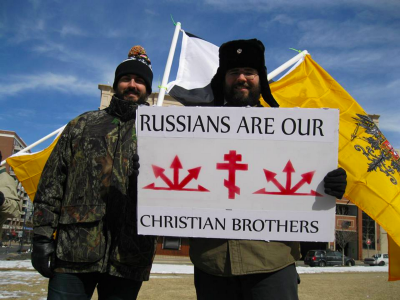 And here are some photos of American separatists in Russia. 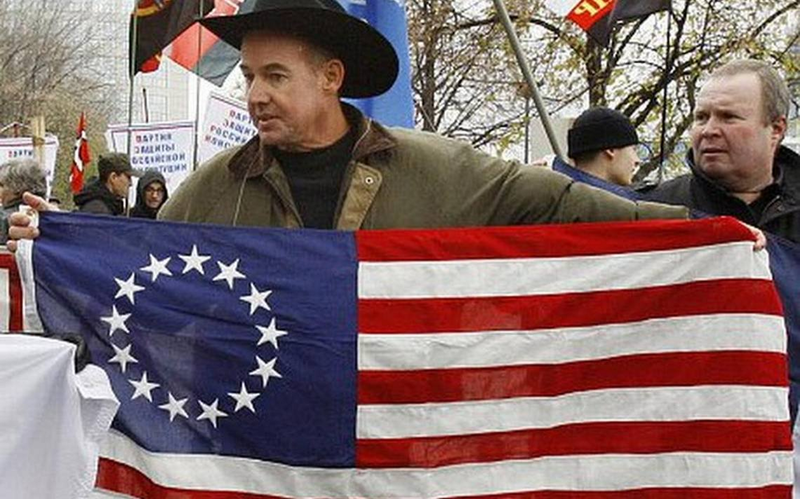 Left and Right: Preston Wiginton, “ “American confederates-separatist” and supporter of Texas seceding in Moscow, at the Russian Nationalists’ March. 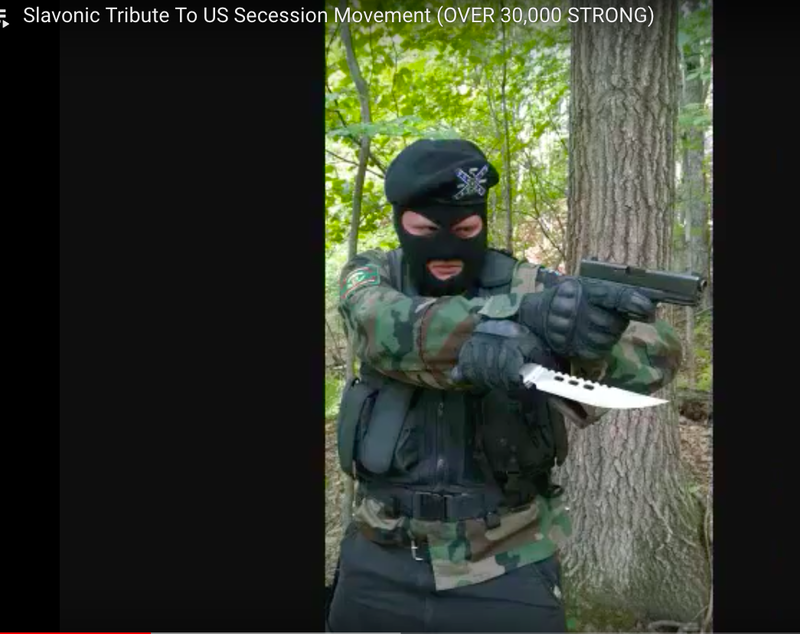 “Slavonic Tribute to US Secession Movement.” Screenshots from a Youtube video. Note “DEFEND OUR BORDER NOT THE UKRAINIAN BORDER” poster. 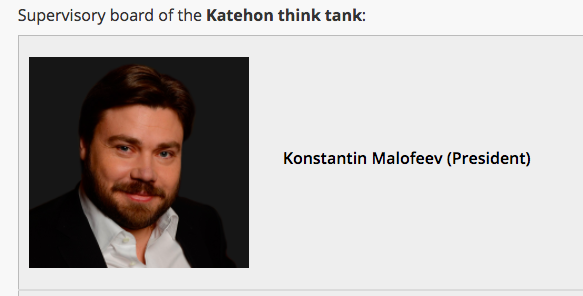 Russian right-wing nationalist Konstantin Malofeev, the founder of Marshall Capital, one of the leading Russian investment groups, allegedly sponsors Dugin’s projects, like Katehon and “Orthodox TV channel” Tsargrad. 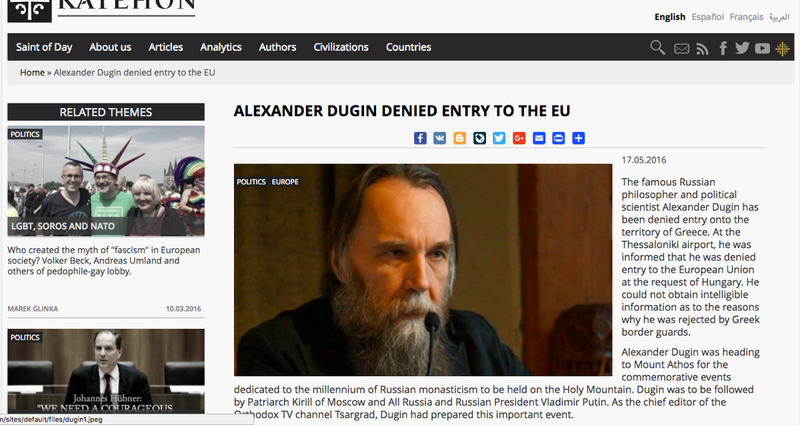 Left: Dugin was denied entry to EU. 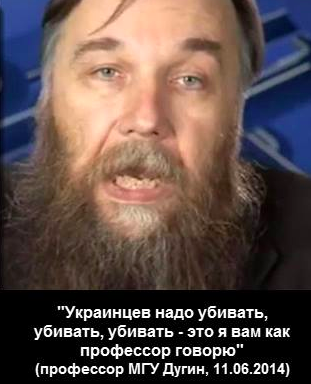 “Alexander Dugin was heading to Mount Athos for the commemorative events dedicated to the millennium of Russian monasticism to be held on the Holy Mountain. Dugin was to be followed by Patriarch Kirill of Moscow and All Russia and Russian President Vladimir Putin.” Right: Konstantin Malofeev. Malofeev is connected with Russian Orthodox Church and Patriarch Kirill, a former KGB officer. 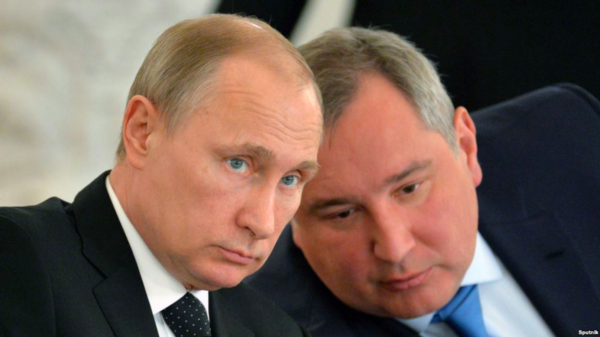 Malofeev is one of the chief financiers of Russian mercenaries fighting against the Ukrainian government. 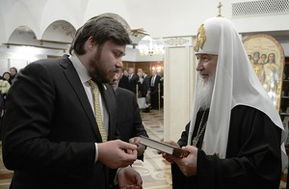 Left: Konstantin Malofeev and Patriarch Kirill. 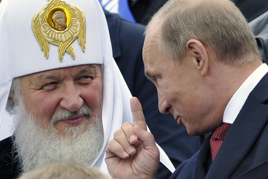 Right: Patriarch Kirill and Putin. 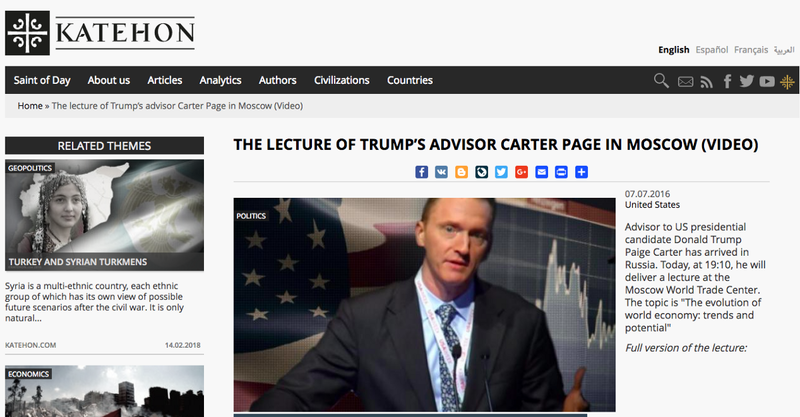 Curiously enough, Katehon website also covered Carter Page’s visit to Moscow. Is Carter Page a Russian Orthodox? Left: ““After the reunification of Crimea with Russia and the beginning of operations in Ukraine, he was one of the few American experts who called for understanding the actions of Russia. 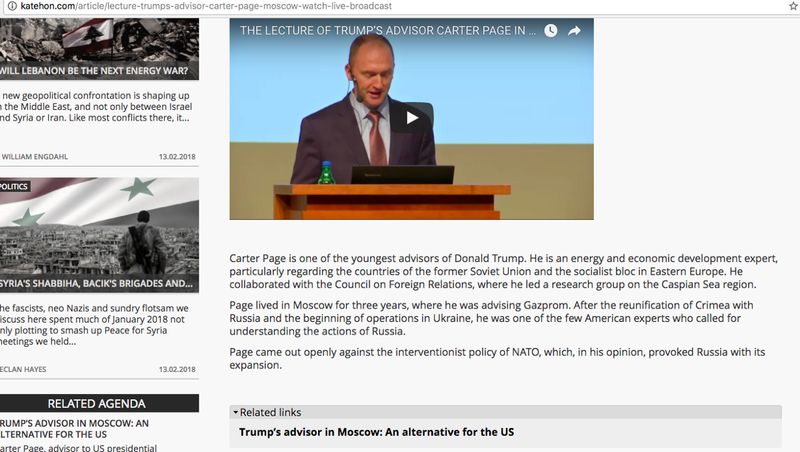 Page came out openly against the interventionist policy of NATO, which, in his opinion, provoked Russia with its expansion.” Right: The Lecture of Trump’s Advisor Carter Page covered in Katehon. School shootings, terrorist attacks and natural disasters are often created or used to distract the public attention from the unwanted discoveries in media. Read about this propaganda tactic here. Left: Screenshot from Hamilton 68 on February 16, 2018. 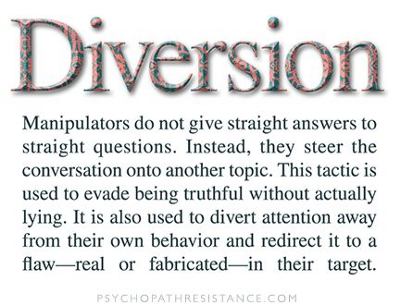 Right: Diversion. 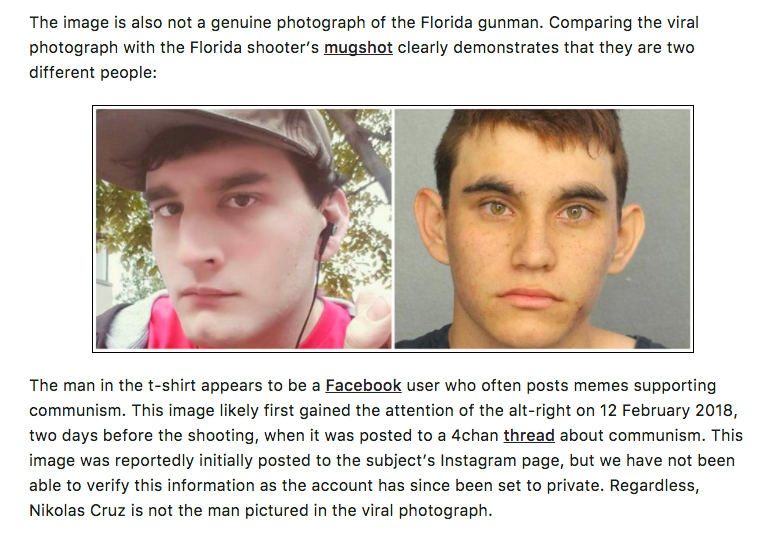 According to Wired, “in the wake of Wednesday’s Parkland, Florida school shooting… troll and bot-tracking sites reported an immediate uptick in related tweets from political propaganda bots and Russia-linked Twitter accounts. Hamilton 68, a website created by Alliance for Securing Democracy, tracks Twitter activity from accounts it has identified as linked to Russian influence campaigns. As of morning, shooting-related terms dominated the site’s trending hashtags and topics, including Parkland, guncontrolnow, Florida, guncontrol, and Nikolas Cruz, the name of the alleged shooter. 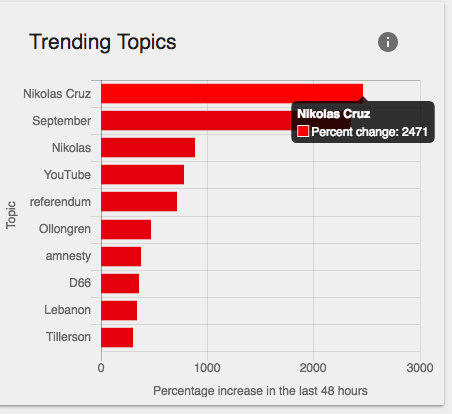 Popular trending topics among the bot network include shooter, NRA, shooting, Nikolas, Florida, and teacher. One of the stories that Russia tried hard to bury this week was the expose of the ties between Paul Manafort, Oleg Deripaska and the Kremlin. In Russia, YouTube and Instagram were threatened to be closed over this story. 2. “Smear campaigns” strategies are used to create the image of internal enemy and “scape goats.” Since Charlottesville, such campaigns against Antifa, some more successful than others, became a compulsory exercise for alt-right, Kremlin trolls and bots. Disinformation is an important tool in cyberwar. I had once caught a bot red-handed retweeting my article about Antifa campaign. You can see the results here. Screenshot from Snopes Fact Check. If we fail to see the big picture, we will be consumed. I grieve for the loss of lives. I don’t do prayers. Think we must. Act we must. *All facts and photos are in public domain and available through Google. Links to the original sources are included. ** Click and hold the clapping hands on the left bottom corner so more Medium users can read it. The longer you hold it, the more claps the article gets and more people will be able to find out this article. Share on the social media: we need independent research. Zarina Zabrisky is the author of IRON and CUTE TOMBSTONE, EXPLOSION, a poetry book GREEN LIONS, and a novel WE, MONSTERS. More at www.zarinazabrisky.com.